Throughout the year, the MTSU campus plays host to a number of events not directly affiliated with the University and which benefit local families, serve the community, and boost commerce. In fact, some of these events serve as the first introduction school-age children have to a college campus, and may even help their young minds hatch the dream of earning their own degrees one day, possibly at MTSU. The following list offers a representative selection of the top 10 reasons for coming to MTSU, outside of being a college student, of course. True Blue! The Tennessee Secondary School Athletic Association (TSSAA) basketball tournament, which annually determines the Tennessee state champion in both men’s and women’s basketball, pops up on the campus of MTSU each March as reliably as the daffodils do. Ditto for the TSSAA’s annual Spring Fling event, where MTSU’s Smith Field serves as the venue for the state high-school baseball championships, while all TSSAA track and field events are conducted at MTSU’s Hayes Track and Soccer Stadium. And don’t forget that annually some 500 athletes from area schools compete in the Special Olympics track and field meet at Hayes Track and Soccer Stadium, as well. The Governor’s School is now in its third decade at MTSU. The pre-professional summer curriculum includes individual and group instruction designed to help each enrolled student explore talents in music, ballet, theatre, filmmaking, and visual art. Students spend about four hours each day, six days a week working in their major concentrations. In June of its 30th anniversary year, Sen. Lamar Alexander, who as governor of Tennessee founded the summer programs for gifted high schoolers, spoke at a welcome ceremony for 305 new participants from across the state and their families during their visit to MTSU’s campus. Established 13 years ago, the camp for girls ages 10 to 17 promotes a culture of positive self-esteem and collaboration among girls while building community through music. Exclusive performances by women in the music industry have included the Queen of Rock, Wanda Jackson. The camp even played a role in spawning a recording act, Those Darlins. Plenty of other camps for K–12 students, summer and otherwise, also dot the MTSU calendar. Some of the higher-profile ones include: the annual CSI Camp for middle- and high-school youngsters, a forensic science camp hosted by world-renowned anthropologist and crime scene expert professor Hugh Berryman; a goat camp; an aviation camp; a youth writers camp; and a host of athletic camps and Recreation Center camps. As the oldest consecutive marching band contest in the U.S., this high-school marching band competition has served as a national model and has drawn thousands of music lovers to MTSU each year. Competing bands, who travel from as far away as New York and Florida, must win numerous honors prior to being admitted to the competition. Founded in 1962 by former MTSU director of bands emeritus Joseph T. Smith, along with the leadership and guidance of Horace Beasley and Linda Mitchell, the contest celebrated its 54th year last October. Literally tens of thousands of Rutherford County high-school students have experienced one of their proudest moments on the campus of MTSU. Almost every Rutherford County high school hosts its annual graduation ceremonies inside Murphy Center. As a result, whether a high school student has graduated from Riverdale, Smyrna, or Stewarts Creek, among many others, they and their families have made memories in cap and gown on the campus of MTSU. Agriculture Education Day in the Tennessee Livestock Center. Christy Limbaugh (Jr) Animal Science major talking about nutrition. Nearly 7,000 students from 12 Murfreesboro City Schools and the Homer Pittard Campus School keep the Monte Hale Arena’s noise level inside Murphy Center at a high-pitched squeal during each annual Education Day field trip, which now coincides with a daytime Lady Raiders regular season basketball game. A partnership between MTSU, which jointly operates Campus School with the Rutherford County school system, and the city’s schools, Education Day exposes students—some for the first time—to a college campus. MTeach, a secondary mathematics and science teacher preparation program at MTSU, produces the annual educational event. 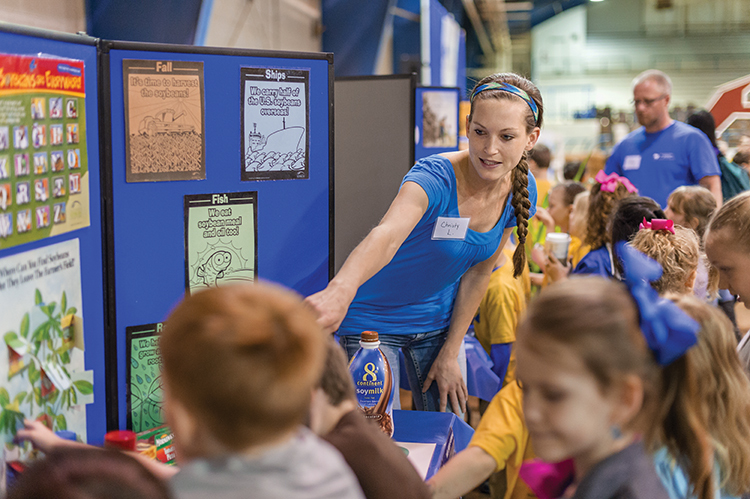 Similar to Education Day, a bevy of annual conferences for K–12 students keep MTSU’s campus hopping on an almost monthly basis. The annual Expanding Your Horizons in Math and Science Conference, now entering its 19th year, plays a key role statewide in encouraging young girls to enter science, technology, engineering, and math (STEM) fields. The Invention Convention, now entering its 23rd year, annually attracts more than 300 grade-school creators for a demonstration of their innovations intended to “make life easier.” Other examples include the 19th annual science Olympiad; the Agricultural Education Spring Fling, held at the Tennessee Livestock Center and involving nearly 900 local schoolchildren; and the third annual Middle Tennessee STEM Innovation Hub Expo, held at MTSU’s new Science Building in April and attended by nearly 300 middle- and high-school students. Faculty from MTSU’s astronomy program conduct star parties each semester for the public and for MTSU students, showcasing astronomy-related events and offering rare views from both the MTSU observatory and naked-eye observatory on campus. Attendees in the past have learned how to view upcoming comets or had the chance to see lunar samples from Apollo missions first-hand. Yet, the best part is getting a chance to peer deep into space via the university’s telescope—the images from which are projected on the high-definition TV screens viewable from the pleasant grassy areas outside the observatory. No wonder Star Parties are a hit for children, adults, and families alike! The Coliseum, located about seven miles from the main campus, is a 222,000-square-foot facility on 154 acres. 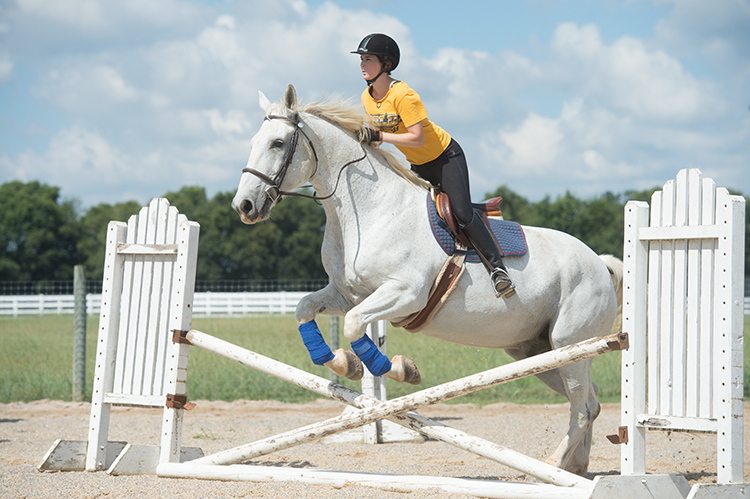 The air-conditioned venue offers seating to accommodate up to 6,500 and stall space for 492 horses during the major equestrian show events hosted there throughout the year. One such event that came to Miller in 2011 was the famous Extreme Mustang Makeover, in which wild mustangs previously untouched by human hands are worked with for approximately 100 days and transformed into trained, performing mounts available for public adoption. Archery, truck and tractor pulls, and rodeos are examples of other events held there. Dog lovers and running aficionados gear up for a rite of spring that gets tongues and tails wagging each year. The annual See Spot Run 5K, which begins on campus, raises funds to build a home for a Rutherford County family through Habitat for Humanity. Hundreds of runners or walkers and numerous canine companions take part in See Spot Run, which generates around $5,000 annually and is sponsored by the MTSU Office of Leadership and Service and the Sigma Pi fraternity. Later, MTSU student volunteers, on average numbering more than 300, participate in the home builds. While not a traditional event like the other nine on the list, the annual campaign earned a spot due to its impact throughout the region. The month-long fundraising event, executed each October, supports a number of local nonprofits that provide a social safety net through a wide array of services. In recent years, MTSU’s more than 2,000 employees have averaged about $130,000 in donations through designated gifts, often made through the payroll deduction option. The campaign allows MTSU to be one of the top entities in our community in donating to the numerous charitable organizations in our area.